Yup - guaranteed to make you look - this assertion goes against pretty much any current thinking in ski coaching and ski racing, doesn't it: how can you not think skiing is athletic?? Of course, I know that skiing is athletic, but that has nothing to do with there being an athletic stance or an athletic position. When we think athletic stance we imagine a sumo wrestler, or a receiver, a goalkeeper, a tennis player preparing to receive etc and some seem to think that this concept, very common in other sports is applicable to skiing! Let's consider for a second the thought that this is not only wrong but very detrimental to ski teaching! To imagine that there is a moment in skiing where the skier is just waiting for something to come to him or her is really, I think you can easily agree: wrong! You're likely confusing your sports: performance skiing is all about turning ! We don't want to be in the back seat, or the passenger seat, reacting to things, but in the driver seat, moving! There is really no point in skiing (let's say technical skiing) where the skier is waiting in a certain "position" or "stance" for more than a fleeting fraction of a second! You're never really waiting, but moving into and out of angles... so the thought of there being a "position", athletic or otherwise, is not something that I can picture as related to skiing! The other thing a notion of an athletic stance imparts is the image that we balance the body between the feet, on a strong, two-footed stance. That cannot be further from the truth, for performance skiing, which is all on the outside ski! In that case, what does the very notion of "stance" mean? Uhh - "switch to... stork mode"? I think this wide or athletic stance approach is a limiting factor in developing strong skiers. I think the roots of the wide stance approach are the "snow plow" position via which most people get acquainted with skiing, where a wider stance makes you feel more stable, but which has nothing to do with performance skiing and carving (which is on the outside ski). The basic contradiction between a "wide stance" and "balancing on the outside foot" are, I hope, obvious at this point. If we put aside speed skiing for now, where you may have to prevent losing either foot when going fast over varied terrain... some don't even seem to realize the basic physics involved in thinking that the inside foot can take over the balance from the outside foot, in a wide stance. The fact of the matter is that, in a wide stance where the body is balanced over the outside ski, the inside ski is so far outside the line of the resulting force, that it is virtually guaranteed that we cannot balance on it, once we lose the support of the outside ski! You'd have to move the body significantly the other way, to restore balance, with even more negative effects! 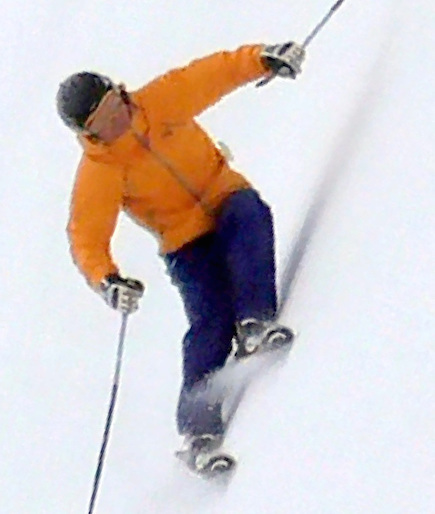 The inside ski is closest to the resulting force vector (against which we balance) with a narrow stance. Look at the photo above and draw the imaginary line between the base of support and center of mass - the inside ski is closest to it when you're in a narrow stance, at whatever degree of inclination you can muster! 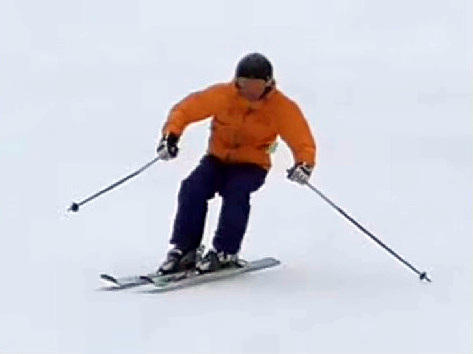 The inside ski is closest to the resulting force vector (against which we balance) only in a narrow stance. This implies a small movement to shift the balance from foot to foot, as opposed to a large movement when in a wide stance. In pretty much all other sports, we need to push to move: walking, jumping, running, sliding, they all require us to push the body against the ground. All, except skiing - in skiing, to keep moving, the exact opposite is true: the more we oppose gravity, the slower we go. In skiing, to keep moving, we need to stop resisting with the long outside foot and do the exact opposite of pushing: flex! So, why is it... pushed so much? There must be some reason behind this "athletic stance", isn't there? Too many great skiers bring it up, for there not to be something behind it! Yes, in performance skiing, there is a moment of floating between turns, one where one is similar to a tennis receiver 1 but if at that moment, when the skis are flat, you have significant weight on the skis, you've done something wrong - in transition you should be light and... floating ! Also, there is no need or benefit from being in a wide stance between turns - in fact, a narrow stance encourages mobility, i.e.shifting balance from the old outside ski to the new outside ski! The other part of it is that indeed, we need to be tense. As skiers, we go through several "phases": in the beginning, we are very tense and the body is locked up and we can barely move. As we get better, we start to relax and that allows many break-throughs in technique. As we get even better, we understand that performance skiing requires a fair bit of tension in the body. For instance, we discover that maintaining coiling in transition requires a fair bit of tension etc. Here are a few definitions for "stance"
Let's take a look at this from a language use perspective - maybe we got it all wrong! the way in which someone stands, especially when deliberately adopted (as in baseball, golf, and other sports); a person's posture. But in skiing... we never stand! sports. the relative position of the feet, as in addressing a golf ball or in making a stroke. So, from this point of view, we could talk of a "wide stance" and a "narrow stance" or a "forward stance" (when the feet are back?) but never of an athletic stance!